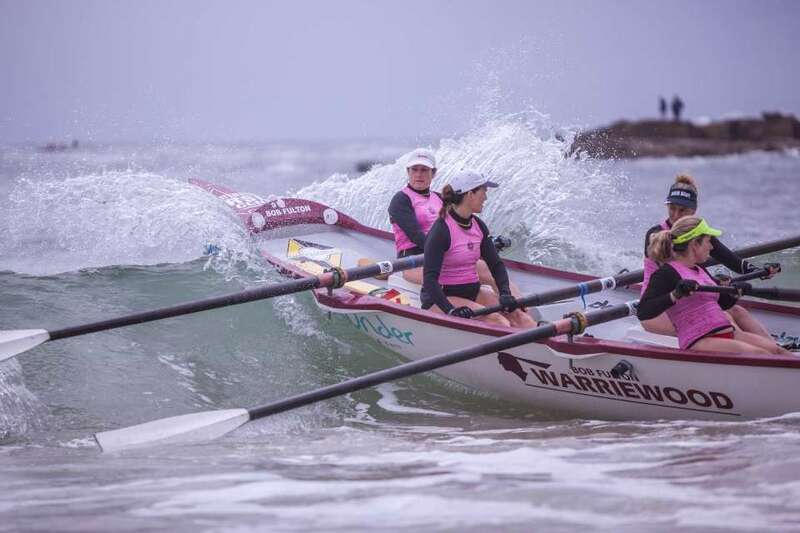 A crew combining Warriewood and Avalon Beach SLS Clubs, as the 'Rustiques', secured 3rd in the Masters Women. 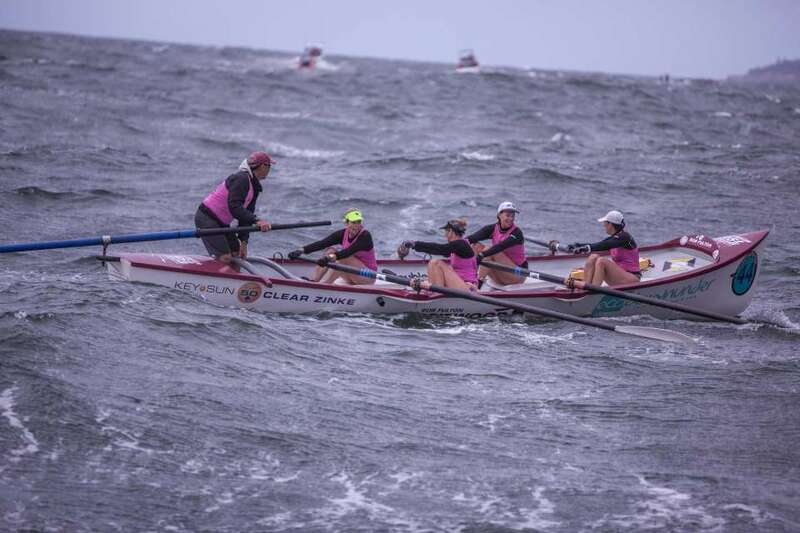 The Rustiques also won Leg 5 of the 2016 George Bass despite a southerly change that came though with 60kph winds and the girls capsizing a kilometre offshore. They recovered to win in 2 hours 40mins. “These were tough legs this year. Torrential rains and unsafe seas meant we had to move two of the first four days for the 2016 George Bass Marathon,” 2016 George Bass organiser Mr. Edmunds told us yesterday. 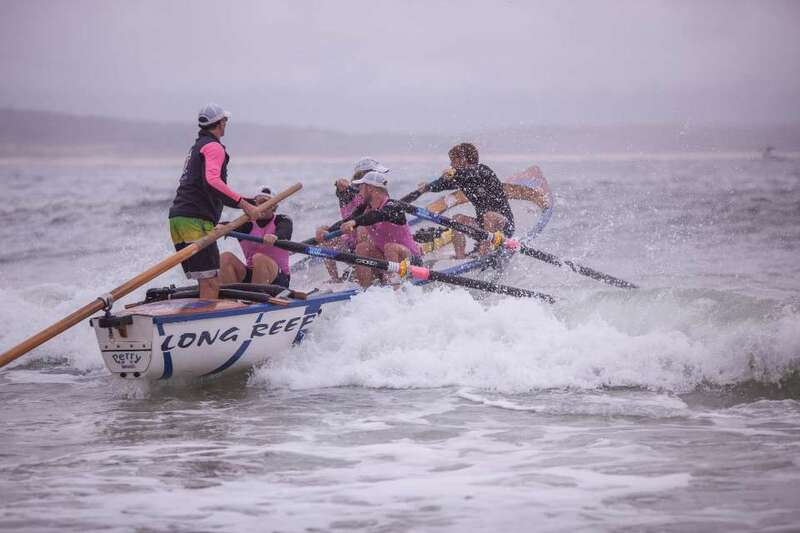 Long Reef's Open Women's crew won 6 of the 7 legs. The one leg they lost occurred when they broke a rowlock - darn rowlock! - and showing that even though they'd won as they headed into the final day of racing they still kept pushing themselves for another Leg 7 win. Long Reef / Moruya Open Women: Kylie Ryder, Marnie Gordon, Sophie Lovett, Margaret Pearson, Jane Coppin, Ali Weyman (wife of Mick Weyman), Clare Immens, Nicole Cowdroy - swept by Brad Coppin. Boat support - Mick Weyman. 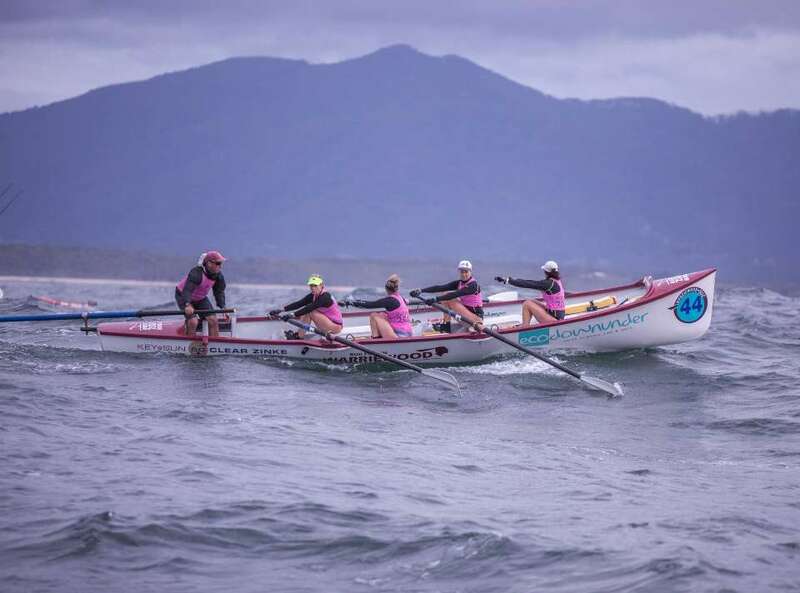 The 2016 George Bass Surf Boat Marathon Open Women winners became a composite crew a short three weeks ago via Facebook when neither could find 8 rowers. 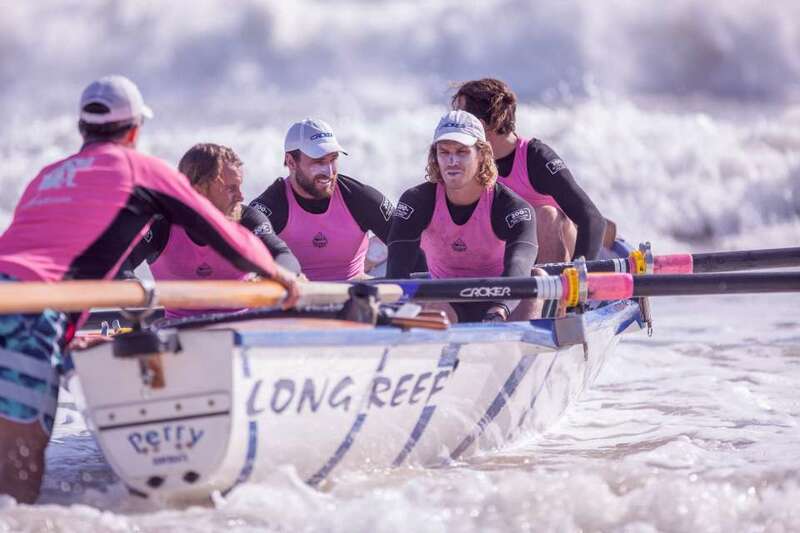 Long Reef Open Men: swept by Rob Pearson, Rowers: Chris Hipsley, Sam Walling, Andrew Dummet, Adam L'Green, Luke Joas, Nick Hadzi, Matt Russell-Jones, Xavier Doran. Open men are the combined Shady Tradies and Dem Apples crews. The very first Bass was run in 1975 with 12 crews including one from Atlantic College in Wales competing. This race was the first time sliding seats had been used in open water surfboat racing. The race was the brainchild of Bega Newspaper editor Curly Annabel as he came up with the concept of tracing part of the journey of early explorer Surgeon Commander George Bass in 1797. Surgeon Commander Bass with a crew of 6-naval oarsman rowed a longboat not unlike surf’s original double-ended clinker from Port Phillip down the NSW coast and around the southern end on Victoria mapping the coastline as they went. The race has been held every 2 years since and is run by a committee of the Far South Coast Branch of SLSNSW. Crews consist of 8 rowers and a sweep. The original seven days for the 2016, prior to changes due to dangerous conditions, were a start at Batemans Bay on January 3 2016 to Moruya a 27 km course - Day 2: Moruya to Tuross, this is the sprint day a mere 19Km - Day 3: Tuross to Narooma some 22Km, Day 4: Narooma to Bermagui a distance of 24Km, Day 5: Bermagui to Tathra, the big one 35Km, Day 6: Tathra to Pambula, 27Km and Day 7: Merimbula to Eden nominally 20 Km. The 19th George Bass Surf Boat Marathon got underway today in fine fashion at Batemans Bay today. 20 surf boats and seven skis hit the water just after 9am at the Batemans Bay Bridge for the grueling opening leg to Moruya. The George Bass Surfboat Marathon has stood the test of time with this year’s race being run in it's 40th year! It began in 1975 and has been held nearly every second year since. 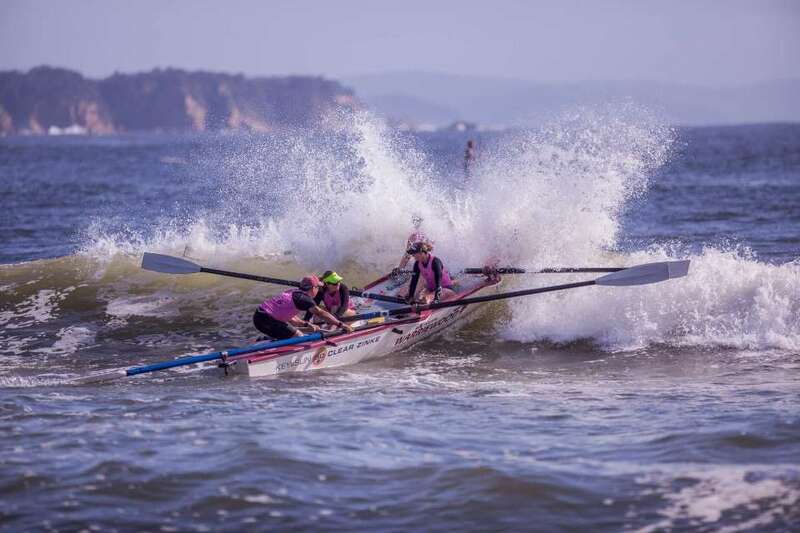 The Bass has proved the toughest event on any rowing calendar anywhere in the world and crews of both men and women compete over seven gruelling days in every element that the ocean can throw at them. Today’s 31 kilometre leg was hotly contested with defending Bass champions Bulli taking out the Open Men. 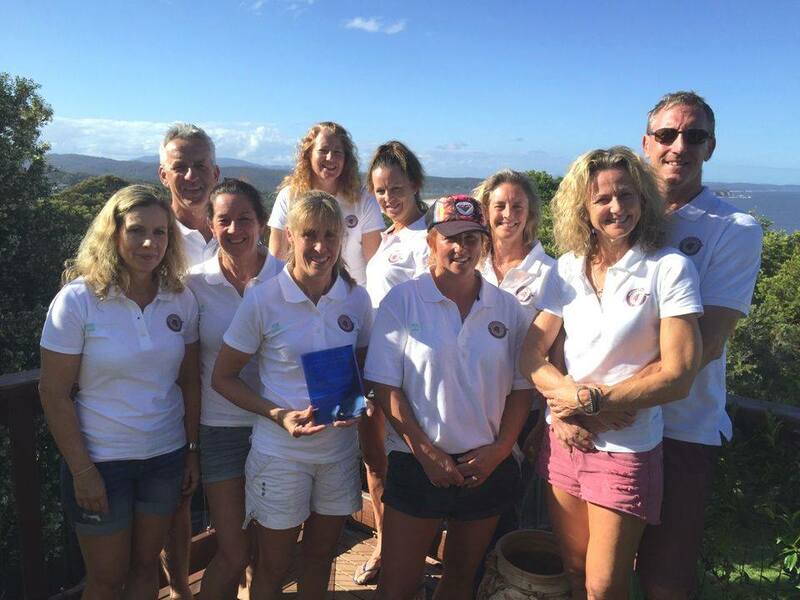 In the Open Women the combined crew of Long Reef Moruya took out the Open Women while QLD crew Tallebudgera narrowly defeated defending champions Narooma in the Masters Men and local crew Pambula took out the Masters’ Women. Marathon organiser Andrew Edmunds said crews were tested in the challenging conditions. “However, the event ran otherwise smoothly with very close racing in all divisions." Mr Edmunds said organisers were still assessing conditions for tomorrow with tough weather expected and large surf. “We’ll continue to monitor day by day but are hopeful of running the traditional course for the 19 kilometre leg to Tuross Head. George Bass Marathon Day 1 Results. Batemans Bay to Moruya 31 Kilometres. 1st Pambula 3 hours, 31 minutes 17 seconds. 7th Pambula/Tathra Juniors 3 hours, 30 minutes, 06 seconds. 5th Pambula 3 hours, 07 minutes, 42 seconds. Did not start: Chris Bond, Andrew Peacock. Day 1 - Surf Boats are GO! Day two of the George Bass Marathon proved highly challenging with organisers forced to plot an inland course for the ocean ski and surfboat event. Today’s race was held on the Moruya River from Preddy’s Wharf to the Town Wharf over a three lap circuit. Bulli and Long Reef/Moruya continued to dominate proceedings today with both taking out Open Men and Women respectively for the second day in a row. Pambula continued their unbeaten run in the Masters Ladies, while marathon defending champions Narooma bounced back from yesterday taking out the Masters Men. The day wasn’t without its challenges however. 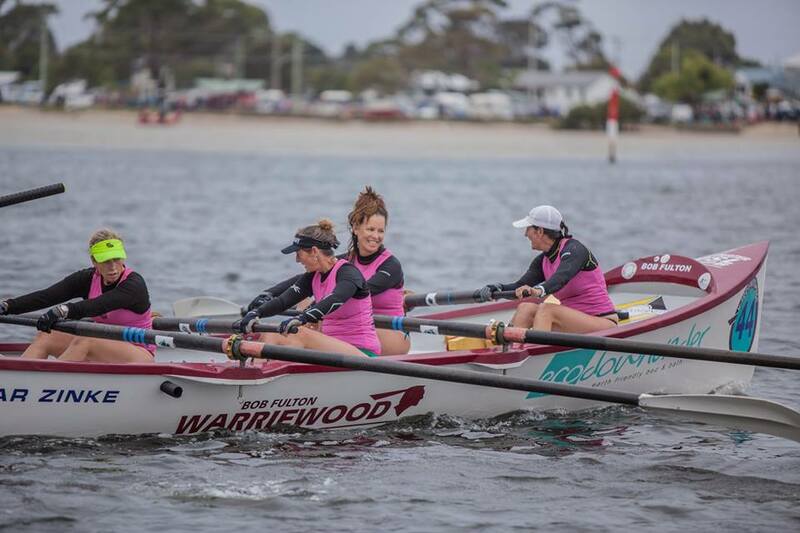 A female rower from Wollongong City was taken to hospital, while another Anglesea rower also received first aid treatment for a minor injury. Race organiser Andrew Edmunds said the crews competed really well in the challenging conditions. Mr Edmunds said he regretted changing the course but safety of the competitors and support craft was paramount. "Conditions just didn't allow for a race at sea today. Instead we have are using a contingency plan for a 15 kilometre row on the river which will test the rowers." Unfortunately for the competitors and supporters Day three is not looking any easier with more rain and large dangerous surf forecast. Mr Edmunds said organisers would again be assessing the beaches in the morning but have contingencies available if required. For the second consecutive day the George Bass Marathon has been forced inland due to dangerous surf conditions. Marathon organiser Andrew Edmunds said conditions today are not favourable for a race at sea. Narooma Bar, Bermagui Bar and Moruya not ideal for support boats to cross and messy dangerous surf at Coila and Narooma beaches. 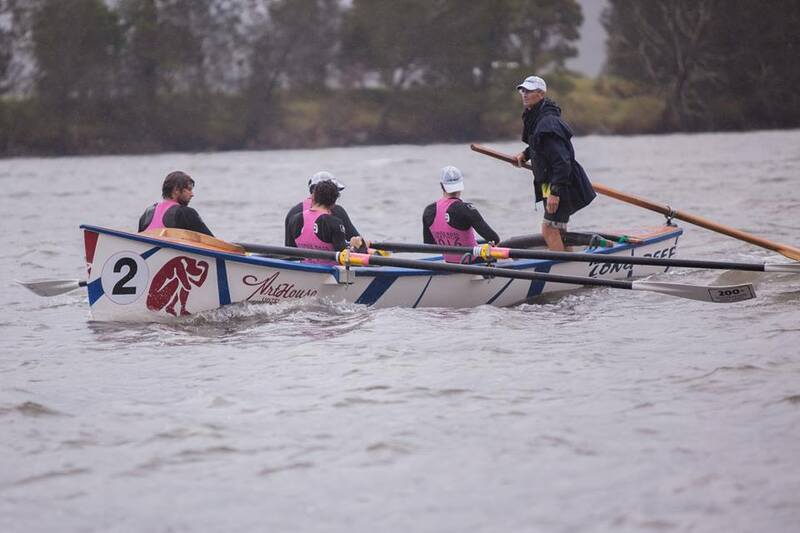 Instead of the usual Tuross to Narooma leg, a 22 kilometre race was conducted on the Wagonga Inlet at Narooma. Mr Edmunds said organisers never like going inland, but have looked for a number of options and a race at sea today was just not possible. Defending champions Bulli, who had previously started the marathon strongly surrendered a valuable lead to the Moruya Vikings. Race Referee Greg Johnston said that result keeps the whole race wide open. Conditions tomorrow are unfortunately not looking any better, but will be closely assessed in the morning. 4th – Wollongong City 2 hours, 30 minutes, 13 seconds. 6th Chris Ryan 2 hours 15 minutes, 31 seconds/Seventh Ed Gwynne 2 hours 21 minutes 19 seconds. Day 3 - A Bit wet - powering anyway! Day Four of the George Bass Marathon has blown wide open the race in the Open Men’s category with four crews vying for top position. Coogee leaped to title contenders after taking out today’s amended leg out of Horseshoe Bay to Cemetery Beach Tilba back to Bermagui. They now are locked in a four way race with sitting at equal first with Bulli, and Moruya Vikings and Long Reef sitting in equal second just one point behind. Marathon organiser Andrew Edmunds said at this stage of the race it is unclear who will be the 2016 champions. Tomorrow is traditionally the toughest leg, a 35 kilometre race from Bermagui to Tathra. Mr Edmunds said the organising committee was hopeful it could run its usual course, but are still concerned about a very strong southerly wind that is forecast. “We will still need to look at conditions in the morning and make a decision." During today’s race one competitor was treated for hypothermia, and a ski competitor withdrew from the race. Overall score not available yet. 30 knot southerly winds have proved challenging for competitors on day five of the George Bass Marathon. The challenging conditions not only vindicated the organisers decisions to alter the course but also led to a boat capsize and forced some competitors to withdraw from today’s difficult leg. Bulli regained form to stake their claim in the Open Men narrowly defeating Moruya Vikings. 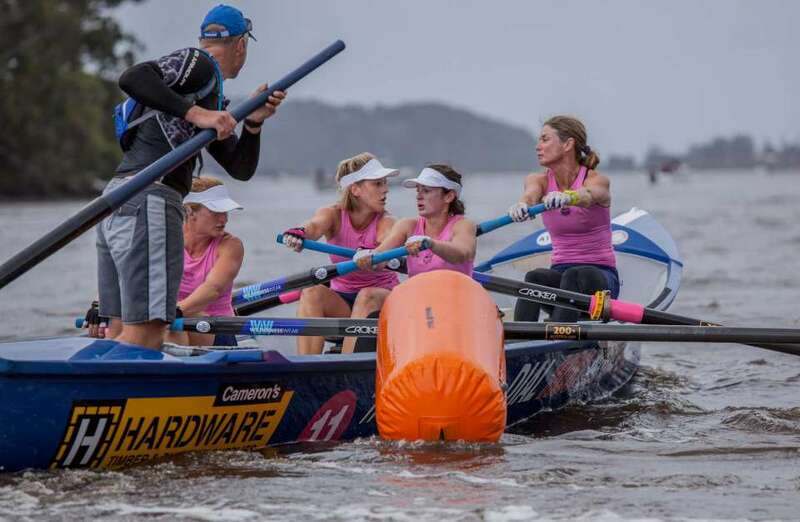 Warriewood overcame a capsized boat and a long row to take out the Master’s Women, Narooma continued their dominance of the Master’s Men and the Broulee Capitals took out the Open Women for their first ever leg win. Marathon Organiser Andrew Edmunds praised the event water safety team and first aid team who enacted the emergency and safety plan when conditions worsened. 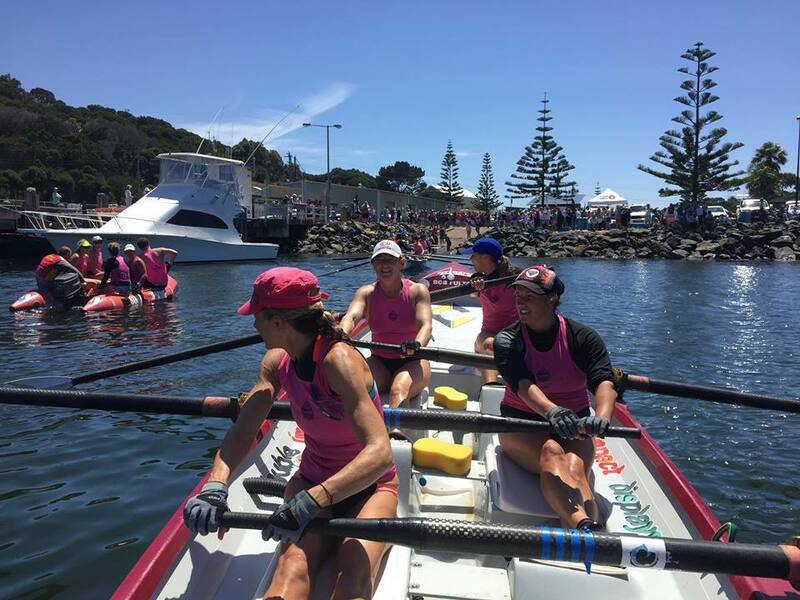 “The Pambula Masters ladies also struggled to handle the conditions and withdrew around the halfway point. That’s a real shame for them as they had been undefeated to date, however the Warriewood ladies were deserving winners of the Masters ladies after a courageous effort. Moruya Long Reef was unfortunate to have damaged equipment which made it difficult for them to race today. Today's briefing will be held at event sponsors the Tathra Country Club at 4pm. The George Bass is also sponsored by Green Homes Australia, Tathra Beachside. The George Bass Marathon is set for a thrilling finish. Conditions have eased on the NSW Far South Coast, allowing the George Bass Marathon to get back on track. 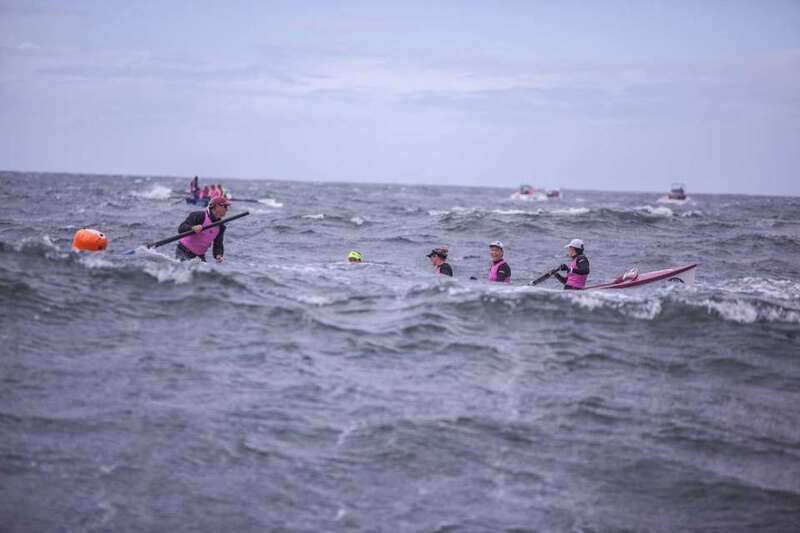 Racing this week has been hampered with torrential rain, large dangerous surf and strong winds which forced alternative courses for four of the first five legs. 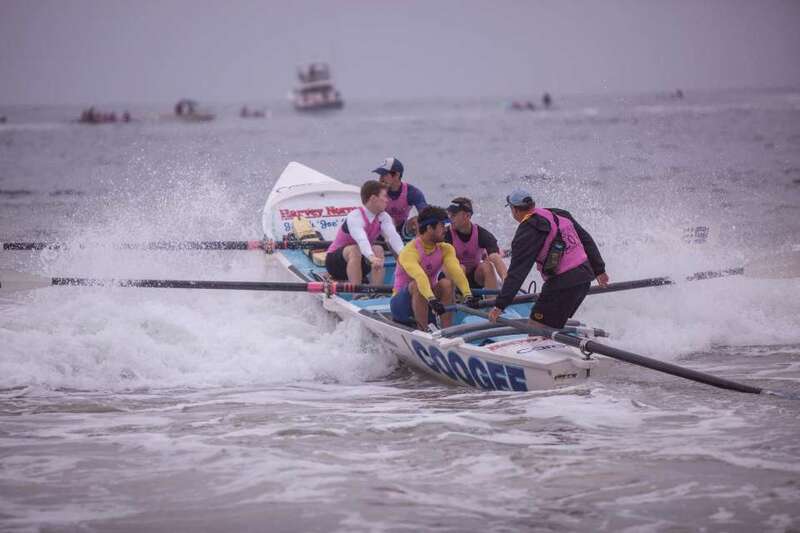 Bulli are the team to beat in the open men, with Moruya and Coogee all in the hunt. Narooma continued their strong run in the Masters Men today, also beating a number of Open Crews as well. Marathon organiser Andrew Edmunds said he was pleased the event could finally stick to the planned routes. "It's been tough for the crews to plan for as each day we've had to make a call on locations and set various courses," he said. "Conditions today were fantastic on the water." The marathon will finish in Eden tomorrow. 4th Long Reef 2 hours 27 minutes 11 seconds. 4th Anglesea 3 hours 10 minutes 05 minutes. 6th Ed Gwynne 3 hours 28 minutes 08 seconds. Bulli have gone back to back in the George Bass marathon successfully defending their title in the Open Men. Bulli had a strong marathon taking out three legs, winning the Nick Dixon Trophy and the Curly Annabell Trophy. Narooma also won back to back titles in the Masters Men, while Pambula took out the Masters Women. 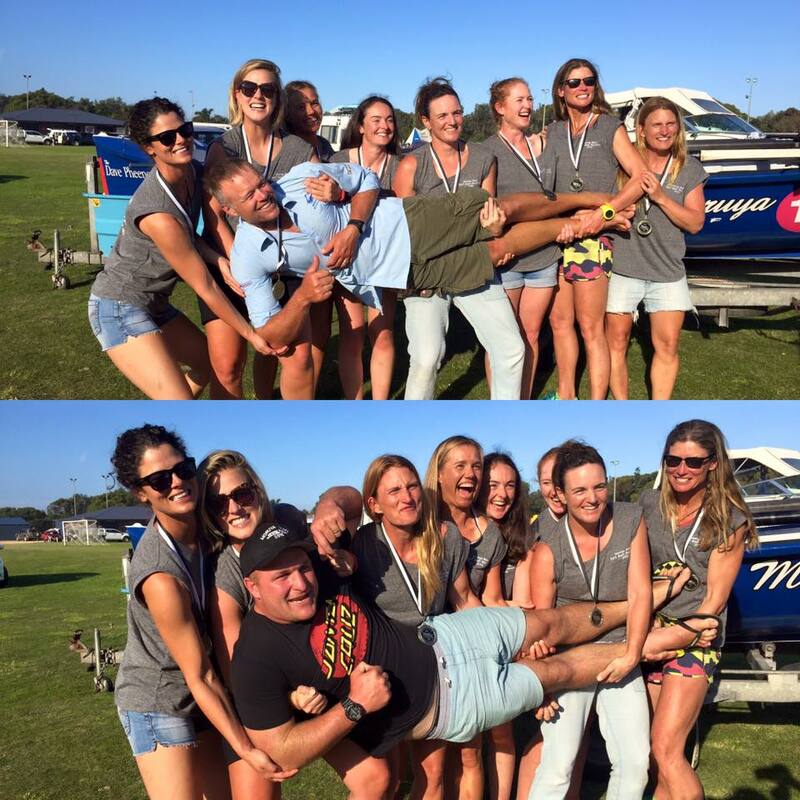 The Open Women was won by the composite crew Moruya/Long Reef. Today’s 22 kilometre leg from Merimbula to Eden capped off an eventful seven days rowing. The Fastest boat over the Marathon was Bulli with 13 hours, 55 minutes, 17 seconds. The fastest female boat over the marathon was the Broulee Capitals with 16 hours and 14 seconds. The Rustiques coming into Eden on Day 7 - that's the 2016 and 19th George Bass Marathon done!